Buckmore Park is not what you imagine when you think of a Karting Circuit. In April 2015 John Surtees, Formula 1 and seven-time Motorcycling World Champion bought Buckmore Park with the dream of creating the look and feel of a mini Grand Prix circuit, a dream that was achieved through a multi-million-pound investment in the track and facilities. 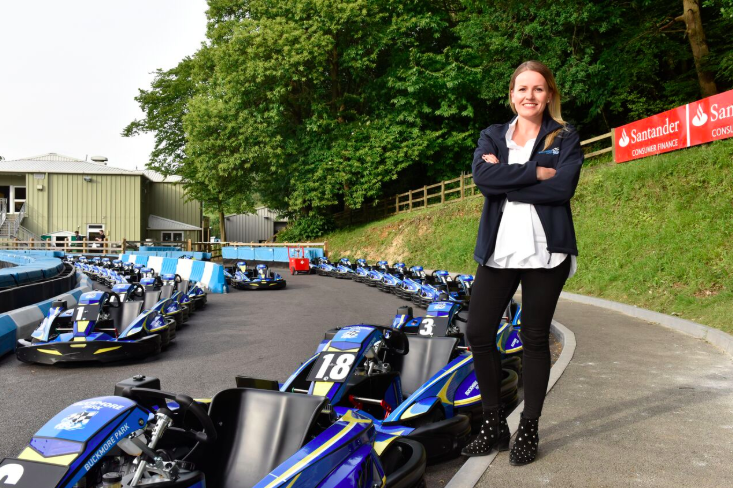 Three years later, Buckmore Park is continuing to cement its place as the pinnacle of UK Karting, now under the leadership of the new Managing Director, Leonora Surtees; daughter of the late John Surtees. Leonora, joined the business in February 2016, bringing a background in HR from retail giants Kurt Geiger and Tiffany & Co.
After two years in the business, and after a heartbreaking year, Leonora has now taken on the role of Managing Director. Improvements and developments continue apace; June 2018 has seen the delivery of a brand new fleet of state of the art Sodi RT8 karts, widely thought of as the best hire karts in the world. Buckmore still remains totally dedicated to John Surtees’ vision of being one of the best karting circuits in the world, and are forging ahead with a new advanced E-flag lighting system which will be installed this summer to ensure Buckmore Park is one the safest and most technologically advanced circuits in the world. All of this has one focus - to provide the best possible experience to everyone who drives and races at Buckmore Park. The future looks bright at Buckmore Park. About Buckmore Park Buckmore Park is a world-class karting facility based near Chatham in Kent that provides hire karting for children and adults aged 4+. Buckmore Park also holds an MSA racing license and hosts championship racing. Bought in 2015 by F1 and seven-time motorcycle world champion John Surtees, the track continues to be owned and operated by the Surtees family, led by Managing Director Leonora Surtees and with 57 full and part-time team members. Buckmore Park is also one of the top venues of choice for corporate events in the South East, providing a fun, exhilarating and motivating experience for teams and clients of between 12-200 guests, as well as a high standard of catering and hospitality provided by the in-house hospitality team.